I should NEVER watch shopping channels in real-time, and NEVER late at night. Not only did I replace my Grand Calibur last week, but I succumbed to the Flexi-pay option and scooped up the big set of D-Lites. DOH! 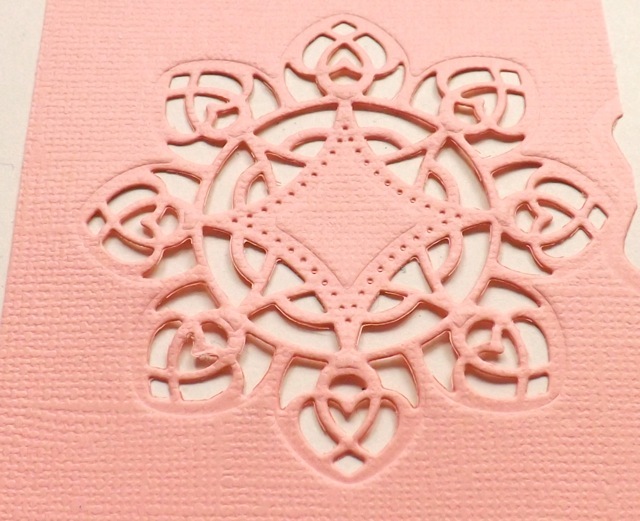 If you use the frame, you can cut our the medallion with a nice scallop-y border then just back it, like this, with a contrasting colour. All well and good. 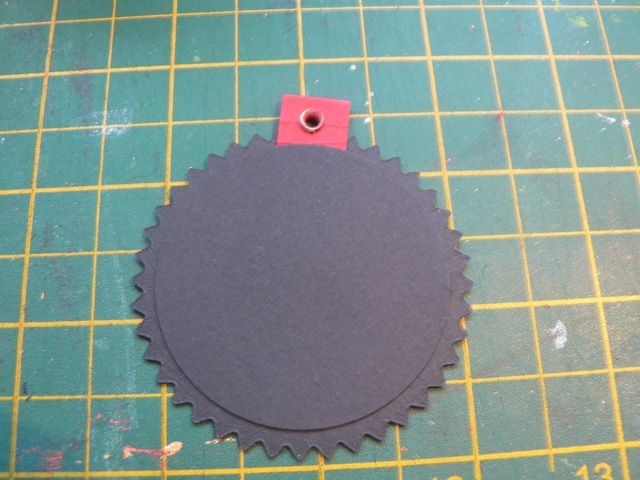 But it gave me an idea – the medallion, on it’s own, when cut without the frame, works pretty much like an Anywhere Punch – ie you can cut the holes only from the cardstock, like above. 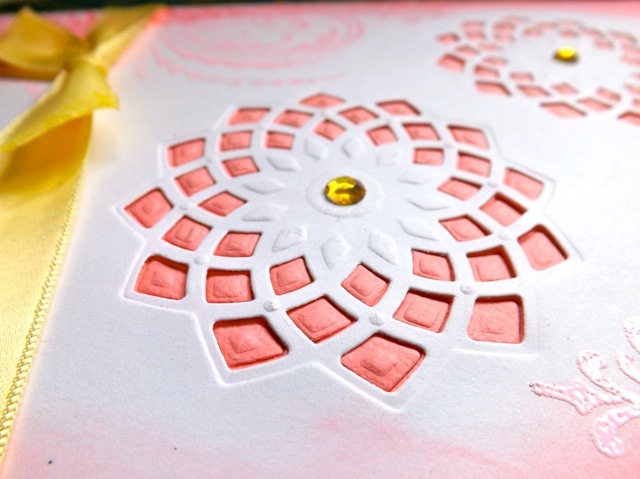 That’s interesting enough, but if you pick a die that has fairly open areas, then EMBOSS the medallion ONLY, then you can back the cut one with the embossed one, and the embossed areas will peep thru the cut outs. A bit like this! and too crisp, which you can possibly see better here. 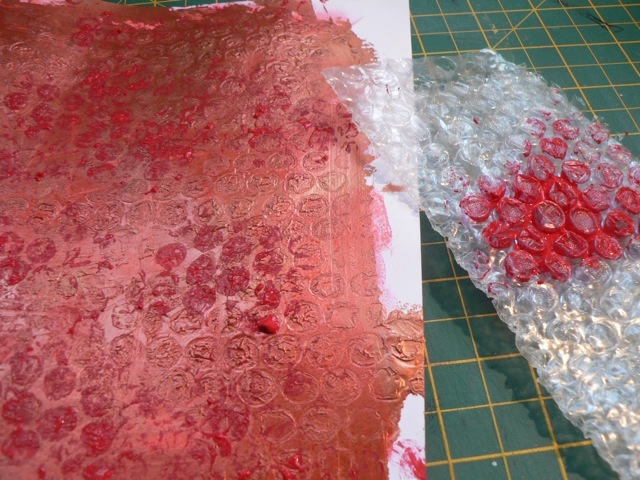 Using the waxed paper helps – I wonder if freezer paper might work even better, to smooth it all out. 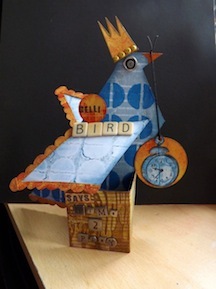 Anyway, here is the card – I hope you can see the dimension! 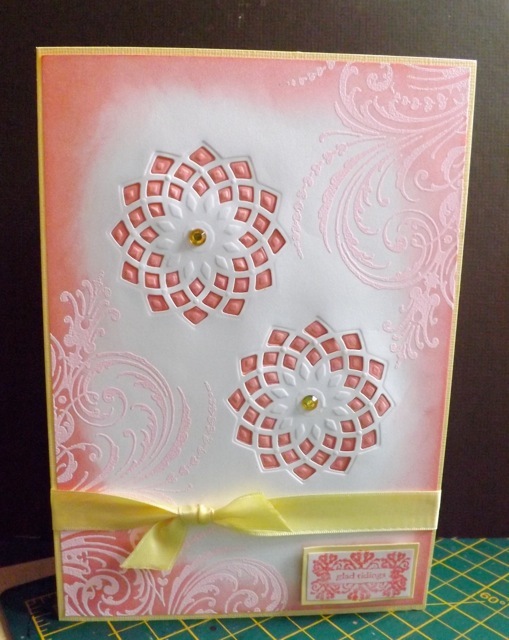 I was working on some fairly thin card to test it all out initially and see if my idea would work, but it ended up so pretty I thought why not do something with it? I needed to see if I would get on with my new camera, hence the Sunday-Right-Here post! 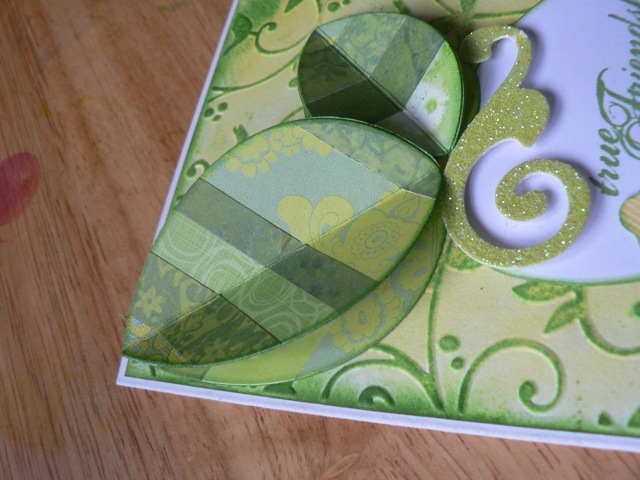 Categories: cards, die-cuts, tips & finds | Tags: cards, how-to | Permalink. OK, like I said, there is little chance of me making a whole other one just to capture the step-by-steps, but I think that I can get you there with the few photos I did manage and some fresh ones that were OK to do. 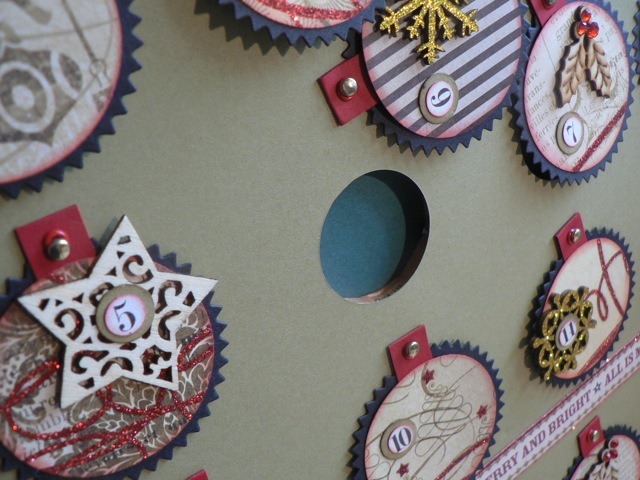 So let’s start with the ornaments that cover the holes. First a couple of things. 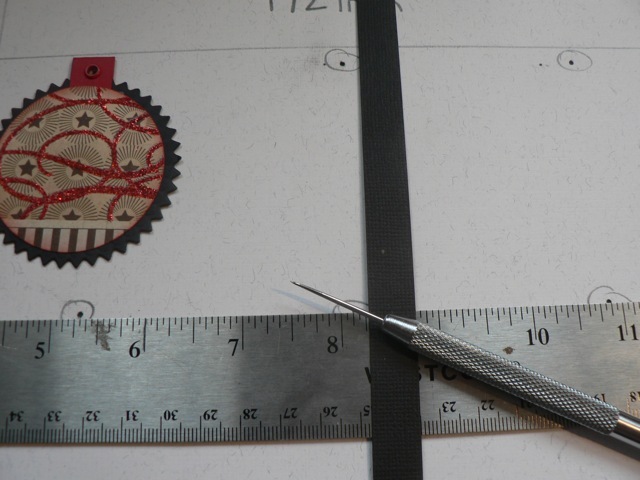 My ornaments measure just over 2 1/4 inches across and just over 2 1/2 inches from the top of the hanger to the bottom. This is all totally subjective. 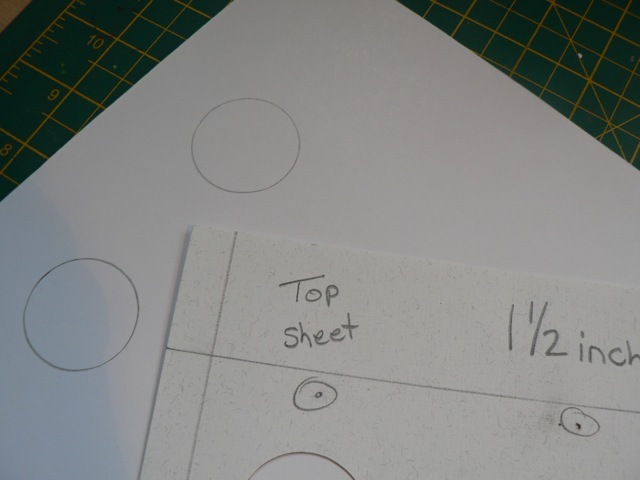 You could make yours many different ways (use a scallop rather than a pinked circle, or use all plain circles, or leave off the outer circle entirely, just to name a few) and any of those changes will matter when I get to the measurements. So start the process by making all 24 ornaments. I showed this before, sort of, but here I am trying to be a bit more methodical about it! 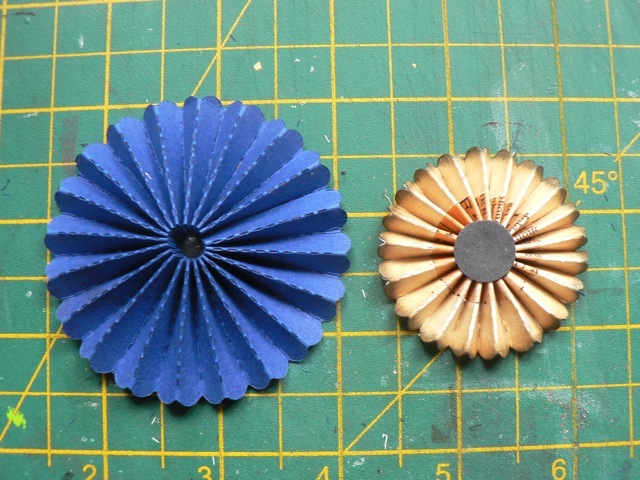 I use the three circles layered to give the ornaments some weight and stability, because I want them to last. 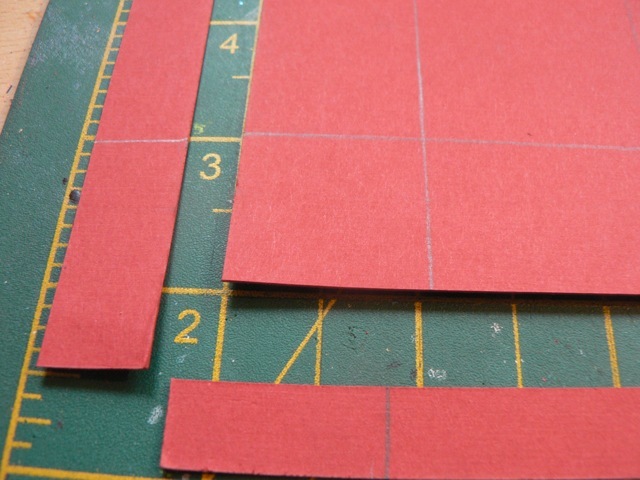 Start by scoring and folding the small strip of red in half. Do not stick it together. 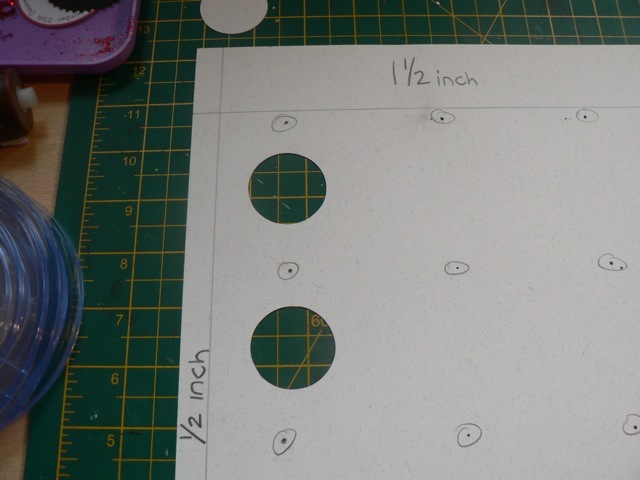 Punch the hole about 1/4 inch from the fold and set the eyelet. 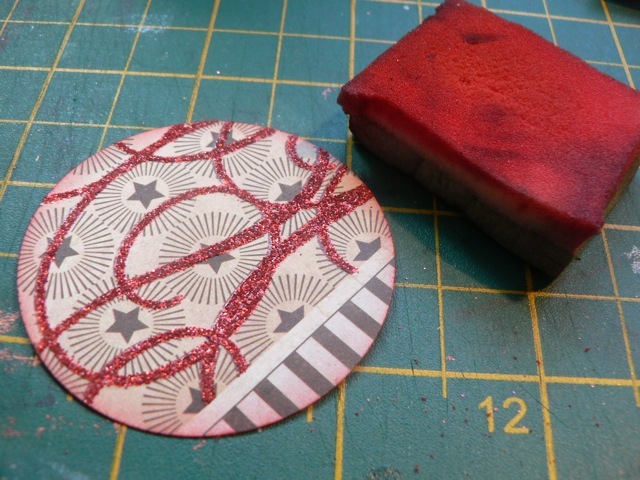 Ink the edges of the circle punched from decorative cardstock. 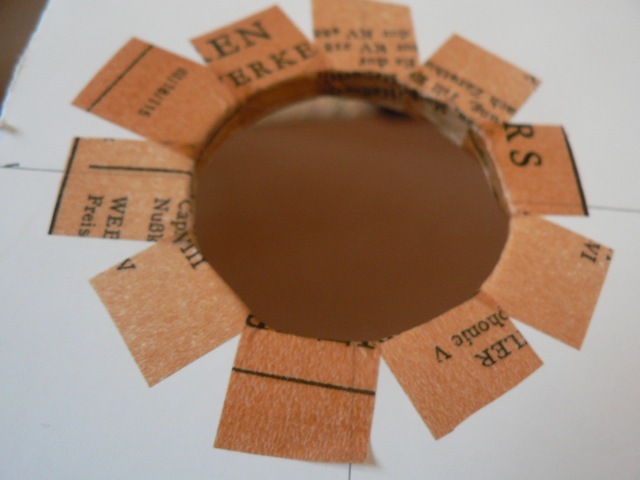 If you pick the right paper, you really need do no more than punch a nice area, like this one, although you can go to town decorating a plain circle from the ground up, so to speak, if you prefer. Can you tell that I incorporated the paper-name strip at the bottom there? I liked the stripes. Now it’s an assembly job. 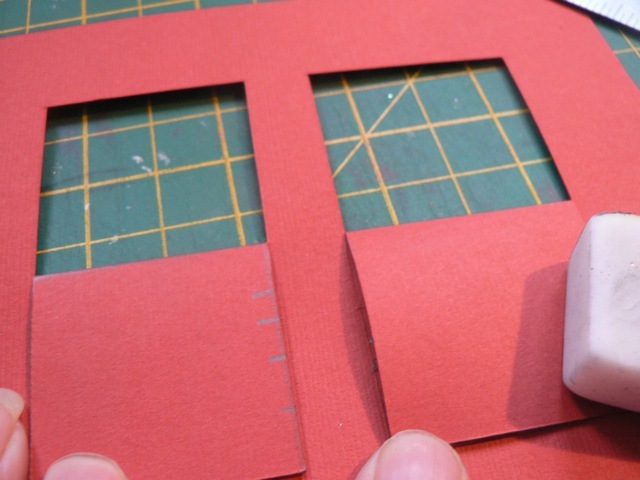 You will need to take care adding the eyelet strip to make sure it is centered and level so the ornament hangs properly, with the pattern level, not wonky. 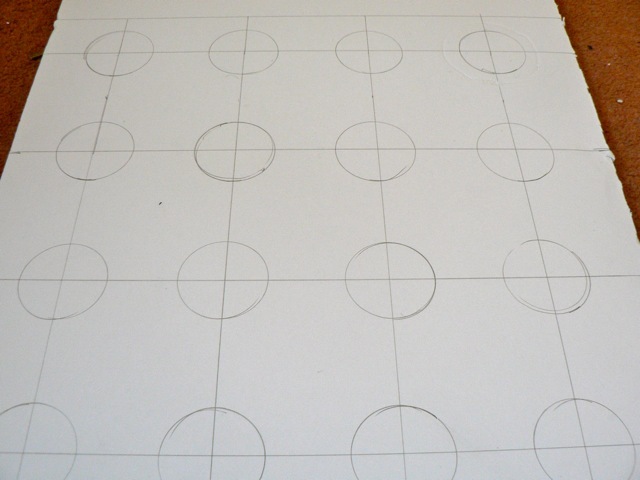 I found it helped to use my gridded mat to make sure. 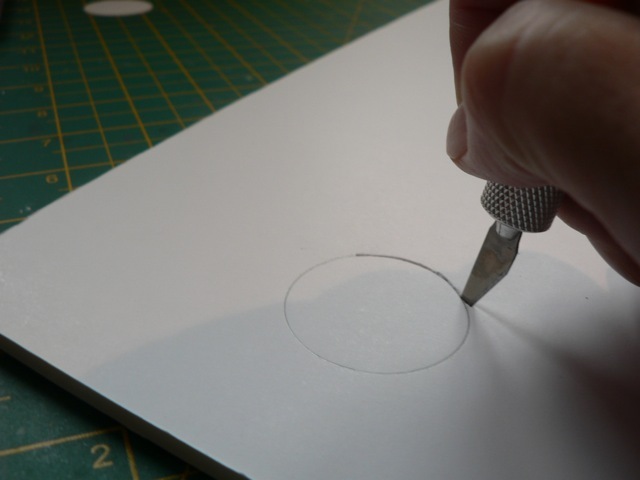 Open up the legs, add adhesive to the ends and sandwich the pinked circle between. 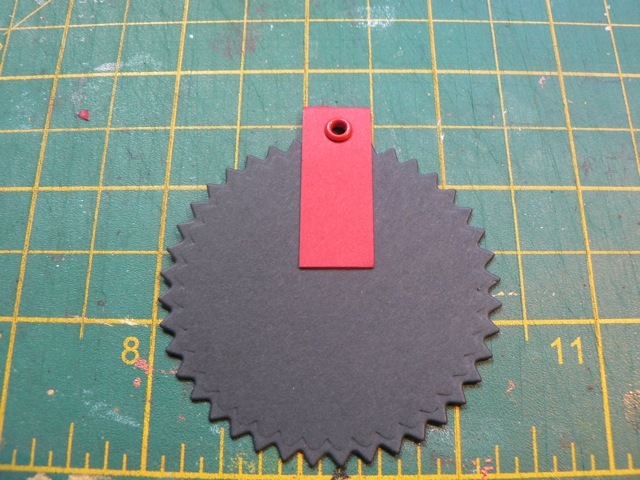 Add the decorative circle on one side and the plain black circle on the other, covering the red strip. That’s it. 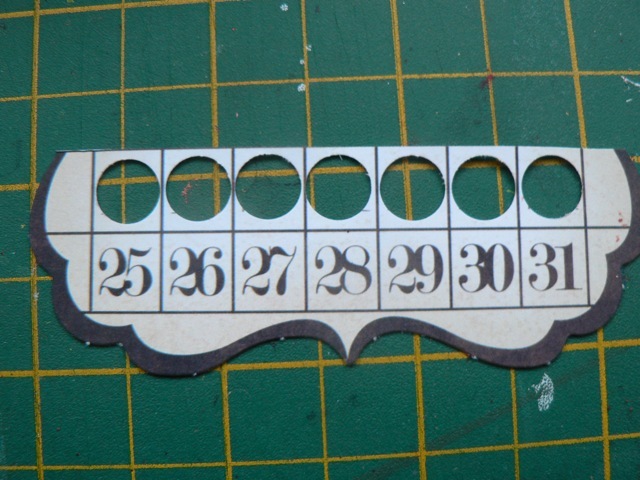 I made the number circles by punching out the small date numbers from one of the kit embellishments and sticking them on plain circles. 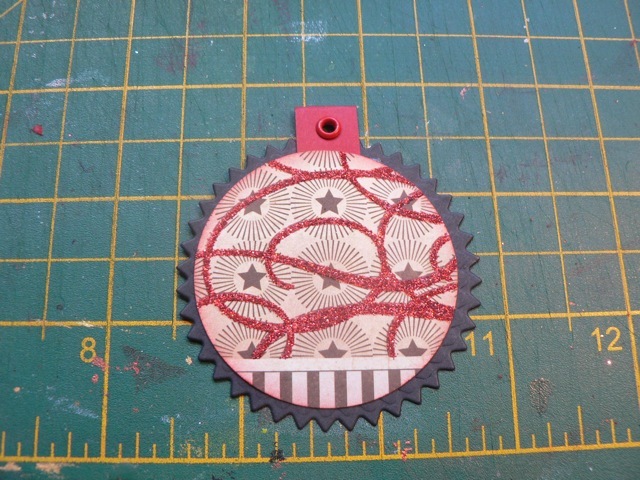 I added them to the ornaments, and added some small wooden shapes too, some glittered, some not. 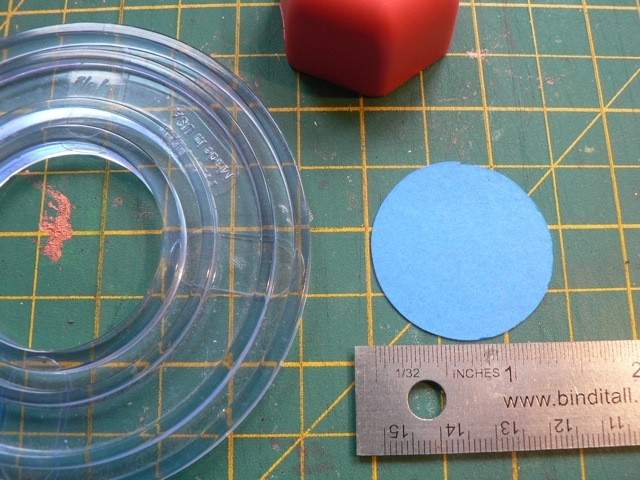 Tomorrow, I will tell you about the base, and how I did that, with some photos and hopefully measurements for my one, as well as some general guidance for laying it all out! 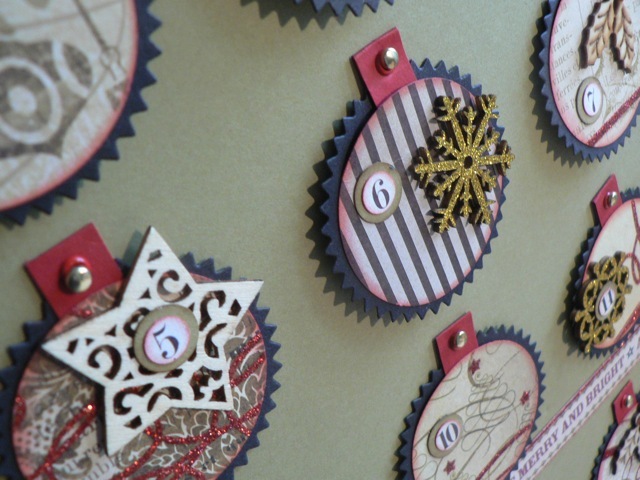 Categories: calendars, Christmas, tutorial | Tags: calendars, Christmas, how-to | Permalink. I am Old Mother Hubbard today – my cupboards are bare! Poor DH came down for breakfast and ended up with hot jalapeno cheese dip on toast. I simply MUST go to the store. But I wanted to get this up and hope you will forgive the dodgy photos. The challenge this week was SQUARES and I immediately thought about my “hidden waterfall” card. 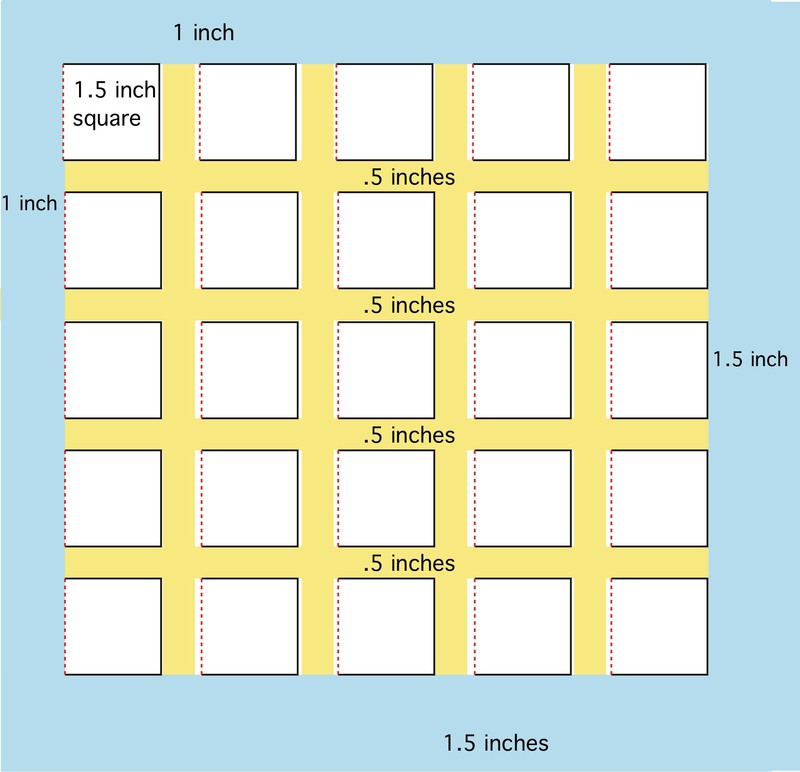 The traditional waterfall is squares, but all the same size, offset so you see a bit of each in the first view. I’ve done a number of hidden waterfalls, where all the flips are hidden behind the first one, but not done standard squares yet so it seemed just the ticket. 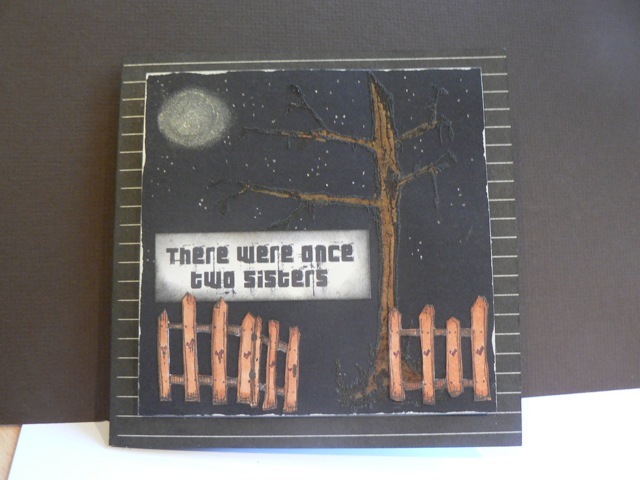 The tree I stamped on the black card then embossed with WOW’s puff black powder. 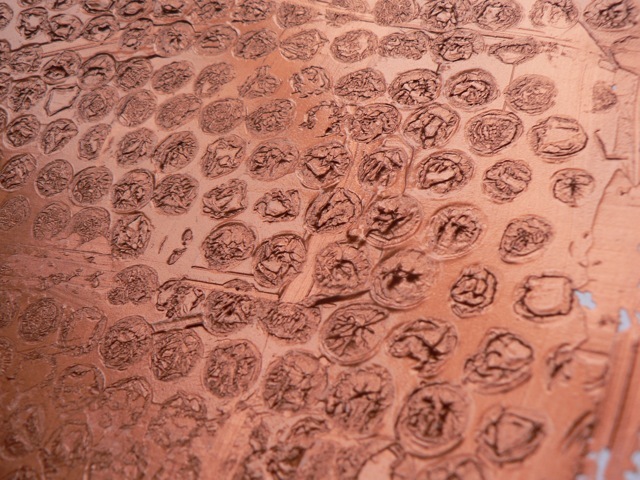 It gives an interesting texture. 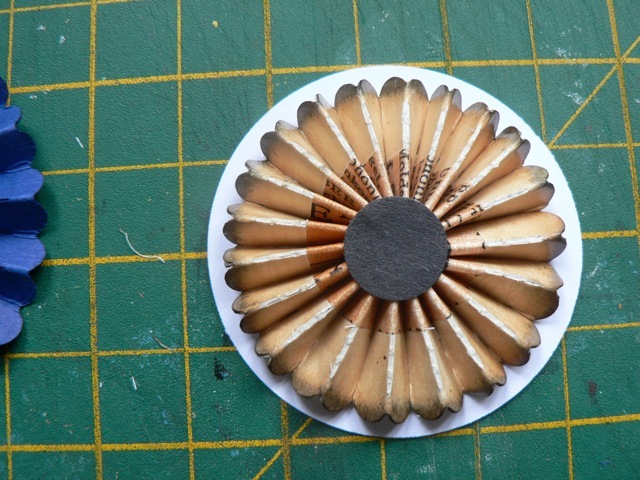 I painted the tree with some mixed Twinkling H20s to make brown, but then went over it with a brown Copic. I love how it turned out. 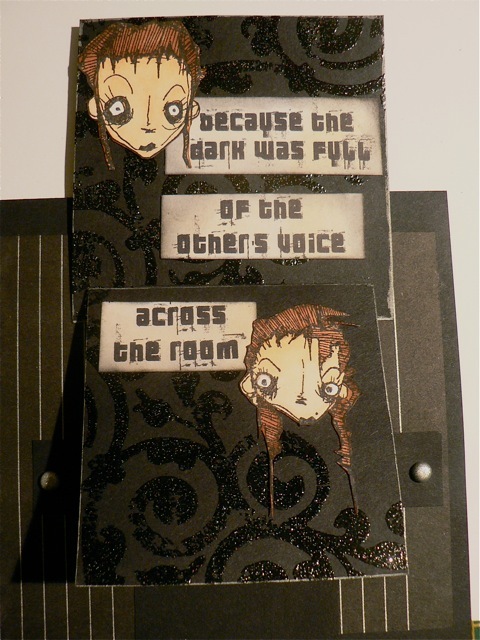 In another deviation, the waterfall is not on the front of the card, but inside, and only three panels. 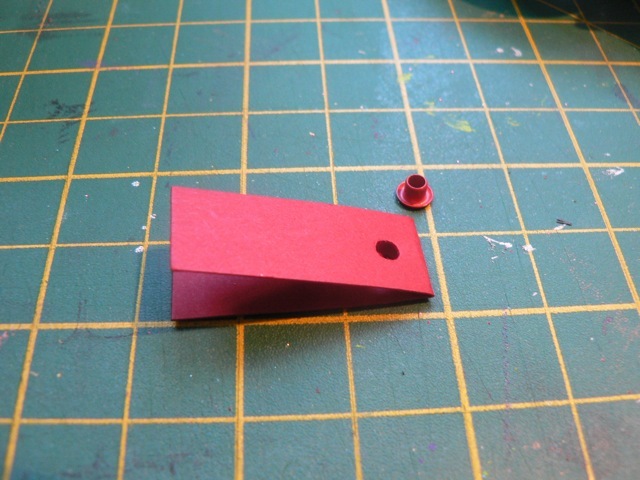 I hollowed out the middle and excised the third head from the washing-machine stamp. Long-time readers (do I have any?) will perhaps recall my sister and her dislike of “creepy” images, and her plea to me to do “cute” – you can guess our time sharing a room was not altogether successful. She’s 8 years younger and at the time was still uneasy in the dark. Me? I like total and complete darkness to sleep. Conflict ensued. 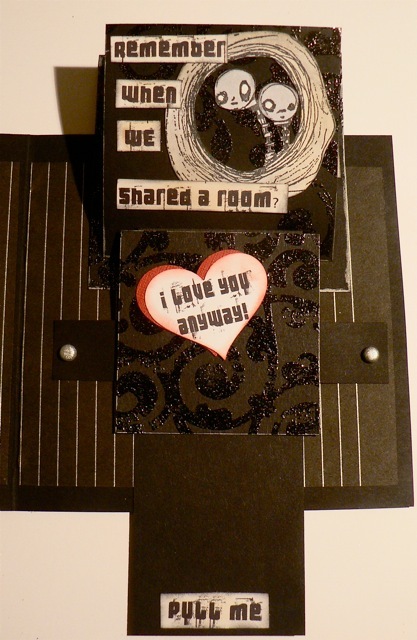 Hence the card, cause now, I love her to bits and miss her most horribly. Maybe when (if) the sun comes out I’ll replace the images with better ones, but I think you get the idea enough from these so I might not. 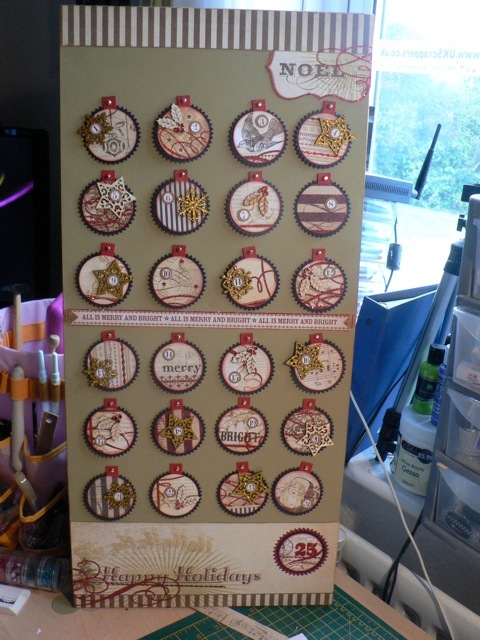 Oh and cause a few people have asked, although I am not totally done yet, here is a better shot of my advent calendar. 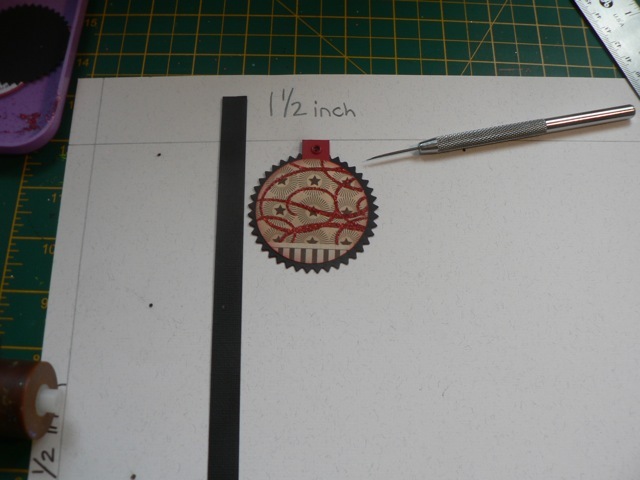 I am just not sure I will be able to capture the steps without making another on, but will hope tomorrow to give some basic guidelines for anyone who wants to make one. Categories: calendars, cards, Challenges, Christmas, stamping | Tags: calendars, cards, Christmas, hidden waterfalls, Stampotique, stamps | Permalink. I have NO IDEA why this year I seem to have jumped the gun on Christmas. Usually I don’t even think about it till the first week in December. Maybe I am finally getting tired of the madness of December every year. 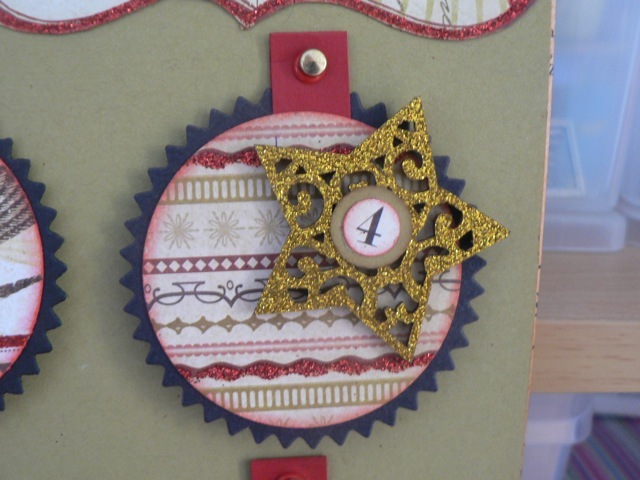 In any case I had an idea for a special Advent calendar after making the little ornament card last week and wanted to see if I could make it work. I did, and it turned out better than I had hoped – but you will have to read the post from yesterday to hear the story of how DD saw it and her idea of an improvement. Ha! 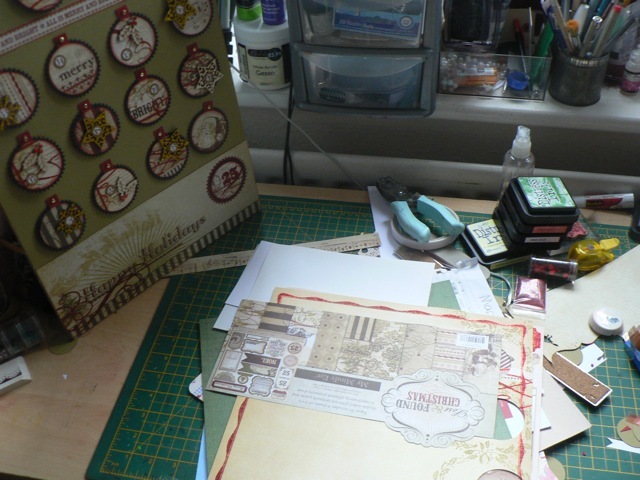 I am so nearly done – I thought I might put the finishing touches on it yesterday but no such luck. 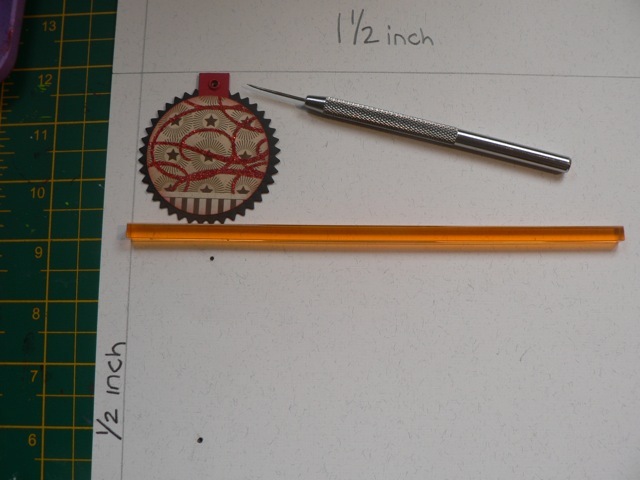 Here it is on my desk – can you get a sense of exactly how big it is? Now it’s time to pop round to Julia’s and desk hop, although time is short in the run up to the UKS CyberCrop, with so much still to do – I’ll make my best effort to hop over to your desk this morning and file away the inspiration for when I’m not quite so stressed out! 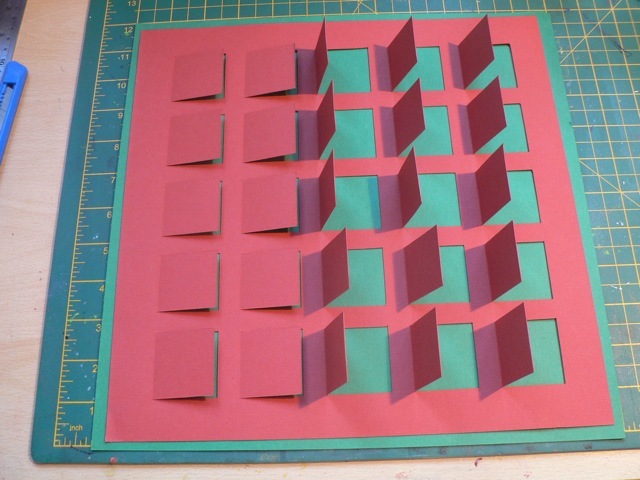 I have been working on a rather complex advent calendar for DD. 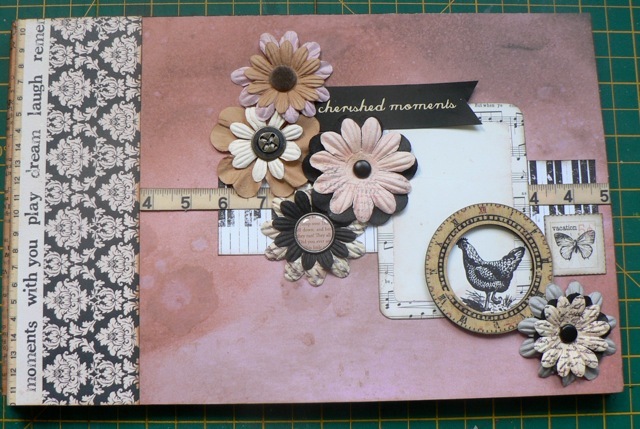 The old one I made is lovely, but it is only meant for adding the tags each day – there is no “treat” and I wanted to make one that had space for a little goodie. Here’s a sneak peek. 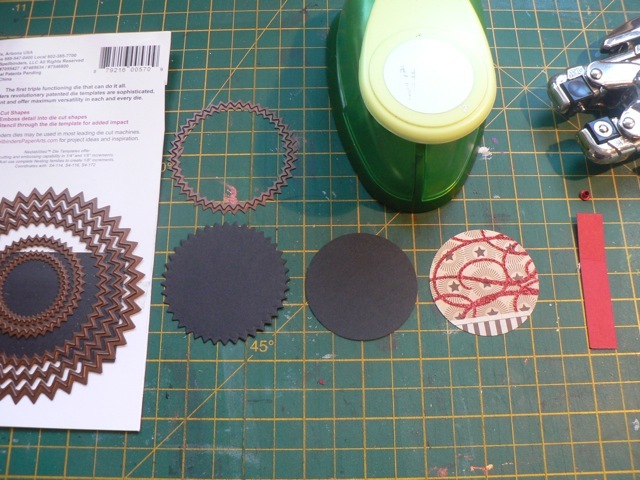 It was one of those projects that got away from me – I started making the ornament bits based on the one from the card last week and I was so far in to it before I even thought I should document it that now I need to go back and see if I can capture the steps. 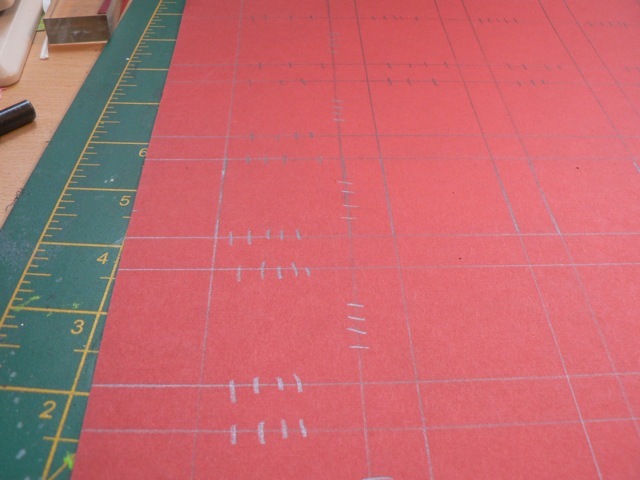 I marked the lines to cut, cause I am careless and would be sure to muck it up if I just depended on knowing which lines should NOT be cut. Perhaps I marked them TOO much as there was a lot of erasing to do since the backs of the flaps were going to be seen. DOH! 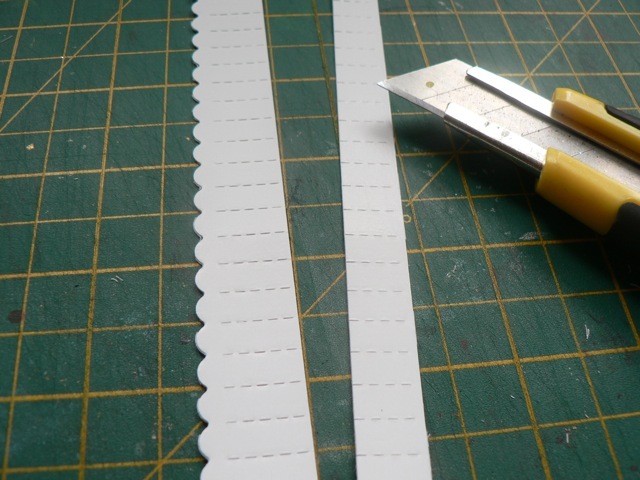 After cutting the 3 side of each flap, I scored the final side and creased. I found it easiest to erase the marking on each flap as I folded them back to crease. Then I mounted the whole thing on another piece of cardstock. I think we can add the number to the flaps and the pop-star images together, getting it ready for 1 December. Then she can keep this one up in her room and my pretty one can go on the mantle! A good compromise. I don’t have time to totally finish the nice one today so it’s likely to be on my workdesk tomorrow – if so, you may get a better shot of it. I will say it is BIG, about 12 x 26, but I am so pleased with it so far I can’t wait to share it! I have been steering away from anything too textural, not sure why. 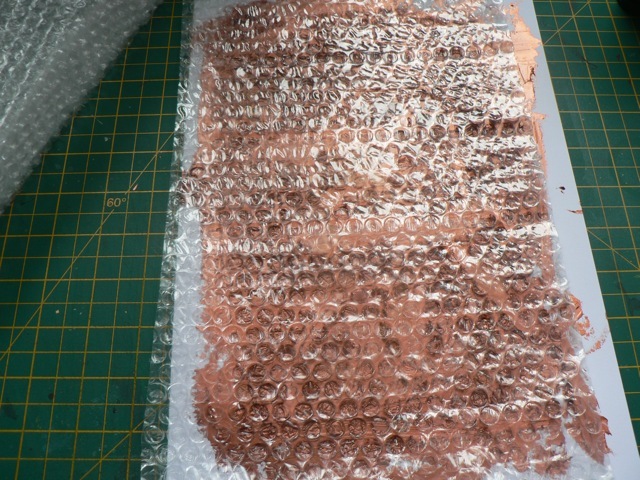 As I had been tidying up, I found a large chunk of bubble wrap. An idea was born. 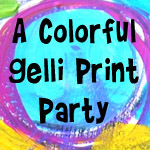 Oh, I’ve done the normal printing with ink or stippling paint with the bubbles but I wanted to do something a little different this time. 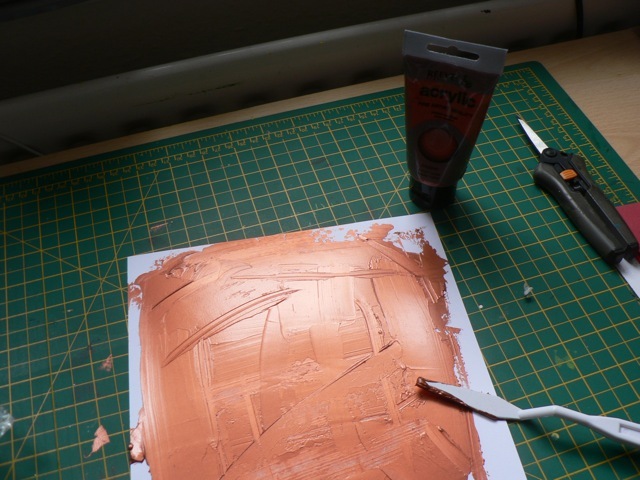 I started by using a palette knife to spread an icing-thick layer of copper acrylic paint on a piece of nice weight cardstock. Moving slightly quickly (although not quite quick enough, as you will see) I laid the bubble wrap over and pressed it into the layer of paint. Left it a bit, then peeled it back. I got a nice overall texture, although in a few places the paint was either too thin or too dry – but I guess that just helped me decide on the next step. 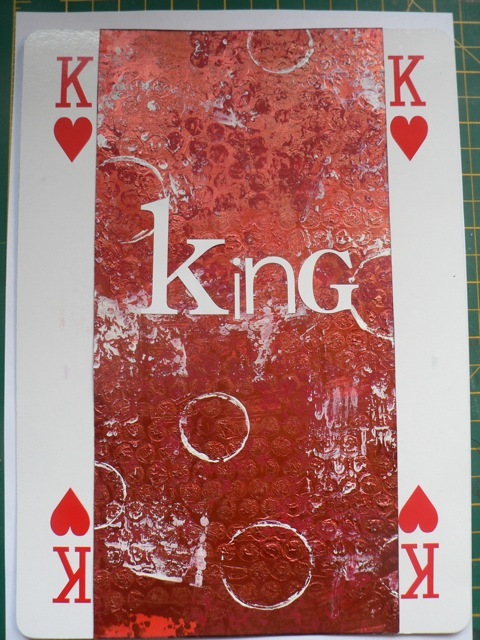 I dripped a bit of red ink and sponged it all over the copper, then used a bit of the wrap to daub on some darker red bits with more acrylic paint. With the palette knife I dragged across a bit of white, then did the milk bottle top circles with more white. White letters and all done. Loving this. Def. one to use again, I think. And experiment with other sorts of things to embed the texture too, like maybe the wavy ridges on the bottom of flip-flops. That might be very cool. Now I have to adjust a bit. I have 14 cards left, the Clubs, and 14 weeks left in the year. I am not sure how realistic it will be to carry on with this thru the holidays. Overall, I have tried a ton on things, some I have done before, some I thought might work and did, some I had read about and decided to give it a go. 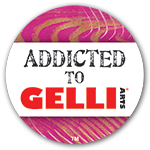 At the very least, even if they aren’t “useful,” or real ART, they have been fun and instructive and that makes the whole thing worth it. Not had much time to go trawling the web for a someplace-else, but I did want to add a coupe of layouts and the mini-book cover that I finished at the crop last weekend. I am also working on a couple of projects that I think are going to be nifty, but not quite ready to share them. Still trying to catch up on old photos – gosh, I have a LOT of them unscrapped. Love Julia’s little paper dolls die, but what tedium to trim the girl’s little skirts (top line) so they become boys (bottom line)! 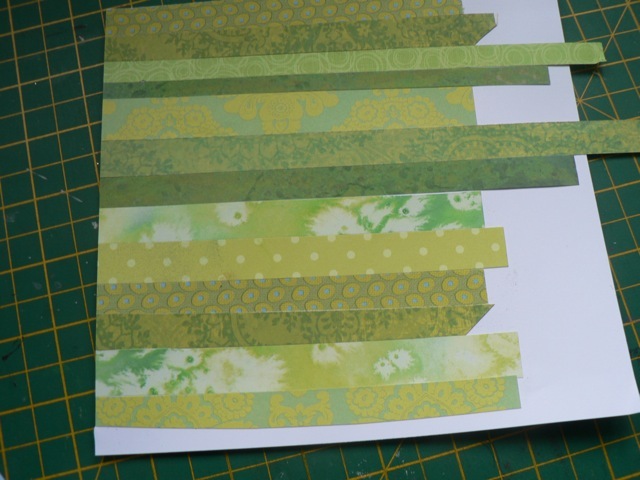 And LOVE that paper tape with grid for journaling. Fab. 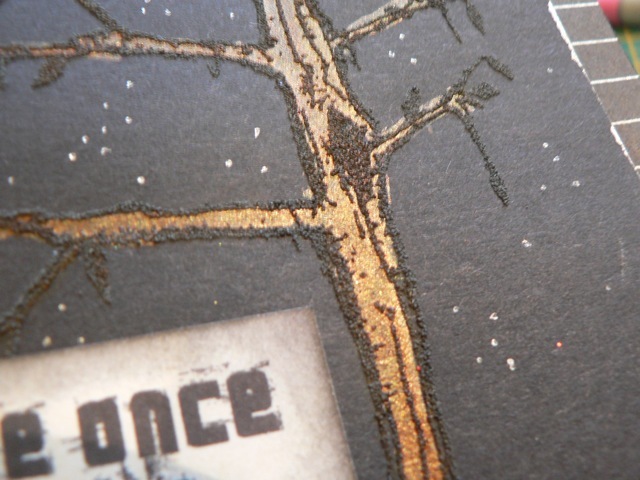 And the mini cover – this is the envelope one from a week or so ago. Still needs a title, but not sure at the moment what I will fill this one with! Now, 100 things to do, no chance of hanging out laundry (too cold and wet) and time is short. See yo tomorrow for a Big Card! 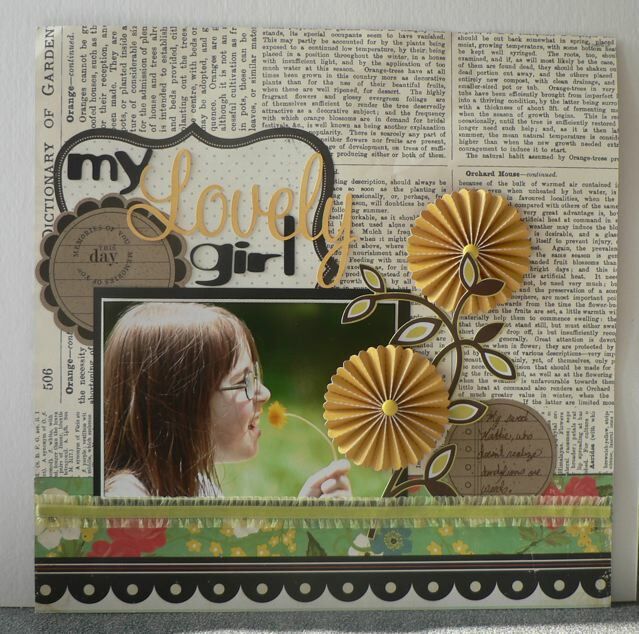 Categories: Layouts, mini-albums | Tags: Layouts, mini-albums | Permalink. 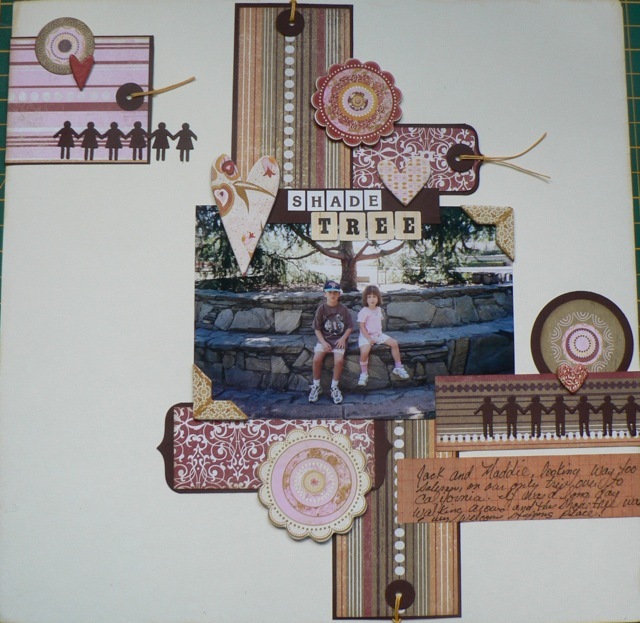 Card challenge – remember Serendipity squares? Every so often over on UKS we get a question about Serendipity Squares. 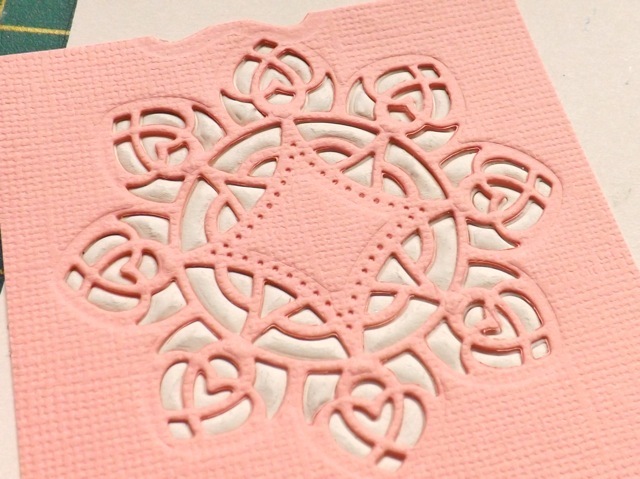 It is an old method of covering a sheet of paper with scraps of various papers, then cutting them into squares. Most of the posts I had in the library are quite old – perhaps it has fallen out of favour, I don’t know. Anyway, I had a random thought about it the other day and when it came time to make a card for the Charisma Cardz challenge (thins with wings this time) it was on my mind. 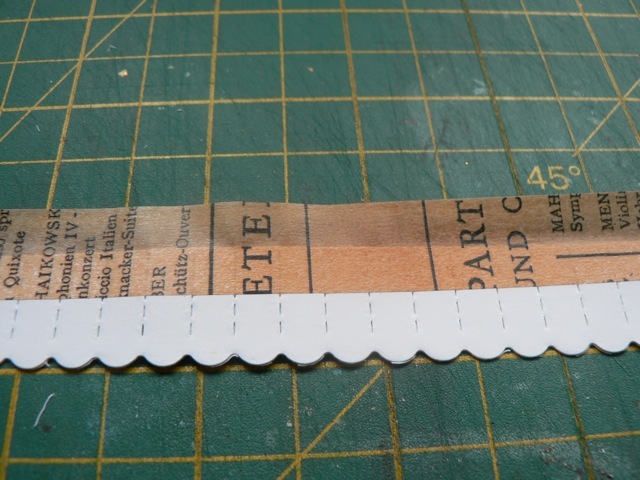 I used strips of various papers rather than torn scraps, but I liked how it looked. 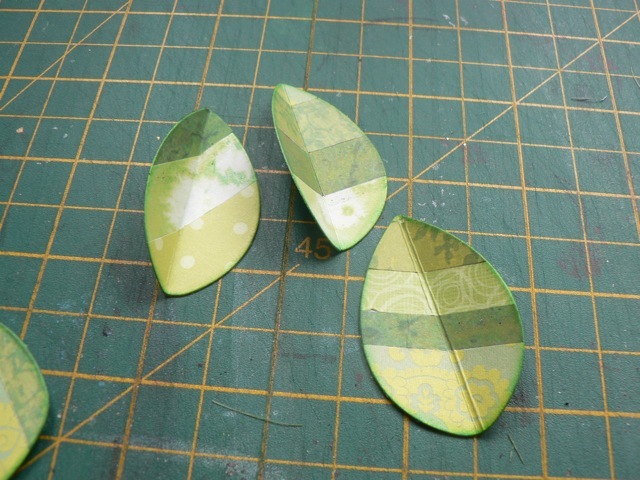 After assembling the sheet I die cut a few leaves. 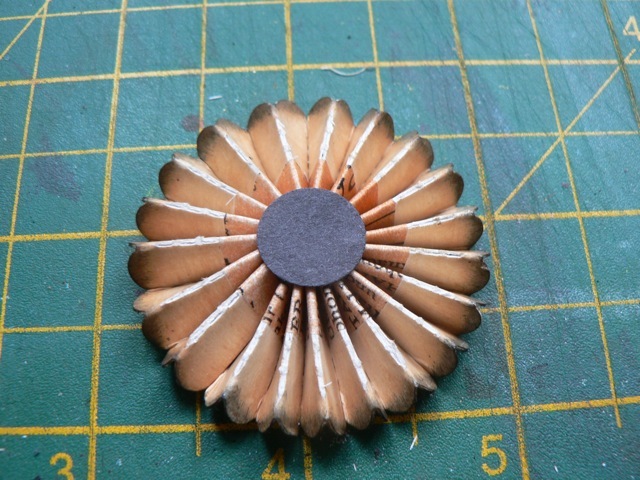 This is an X-cut die set, which I like. I scored them (3 each, two sizes) in half and stuck them together into a 3D shape. The left half of the second is stuck to the right half of the first at the back, then the left half of the third to the right half of the second – forgot to take a photo but I think you get it. 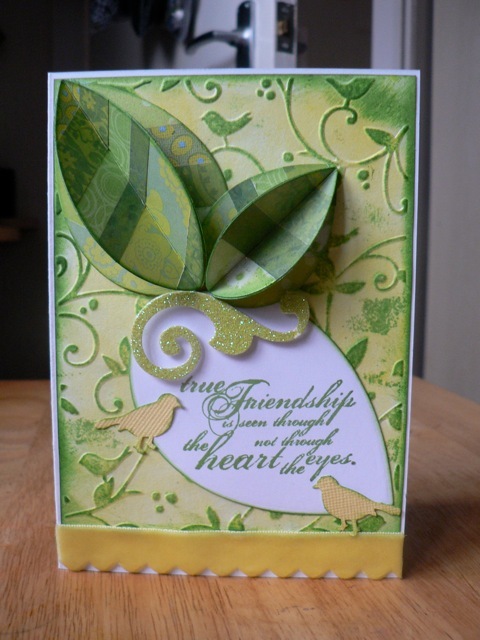 That went on the card front, with an embossed background (with birds) and a couple of little birdie punch-outs. 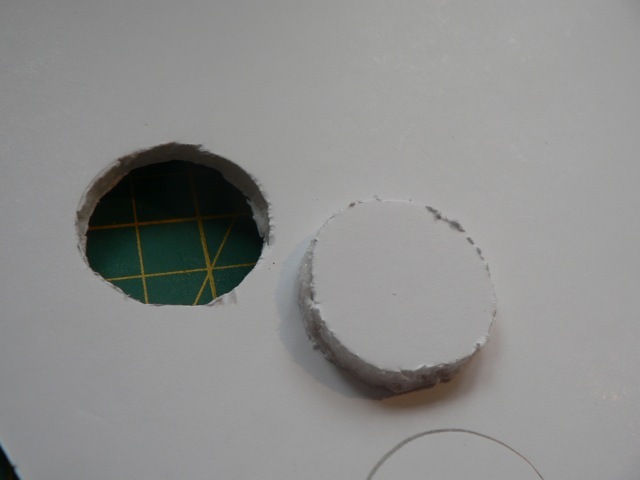 It’s quite dimensional, but the neat thing is the leave squash flat so they fit in an envelope! Very spring-like but it’s been a bit dismal here so I fancied a shot of sunshine! 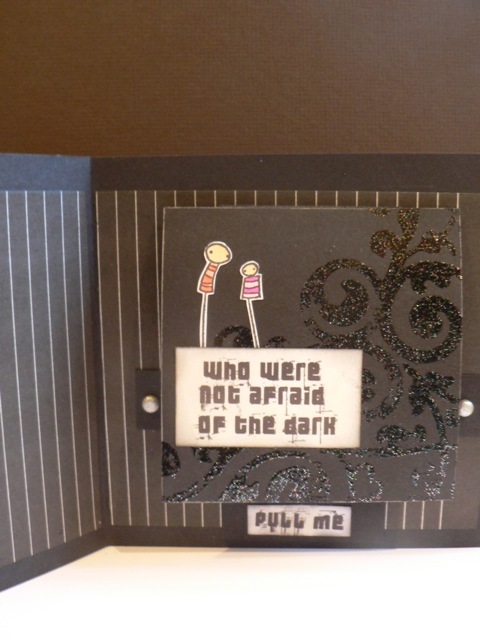 Categories: cards, Challenges | Tags: cards | Permalink.